How Do You Pack a Pachyderm? Maggie, foreground, an African elephant, was just a whisper of her current self when she arrived Sept. 30, 1983, at the Alaska Zoo. She was dwarfed by the zoo's resident Asian elephant, Annabelle. Nowadays Maggie, at 8,000 pounds, is larger than Annabelle was in 1983. Plan ahead -- very carefully. "It's very doable," said Carol Buckley, executive director of the Elephant Sanctuary in Tennessee. "But there's a lot of work that goes into it." Buckley said she has moved more than 20 elephants in the past 30 years. Last week, under mounting public pressure, the Alaska Zoo's board of directors agreed to move Maggie to a warmer climate where she can be around others of her kind, as long as veterinarians determine she is healthy enough to make the trip and zoo staff find a suitable new home. Possibilities include several elephant sanctuaries such as Buckley's and the roughly 80 elephant facilities accredited by the American Zoo and Aquarium Association, about 40 of which house African elephants like Maggie. Alaska Zoo director Pat Lampi said he and his staff will pare those down to a short list for closer research. Board members said they would only ship her by air. Experts seem to agree that's best. An African elephant of Maggie's age and experience -- a 25-year-old who has known little exercise and was last moved as a yearling -- should experience as little travel time as possible, said Randy Rieches, San Diego Zoo Wild Animal Park curator of mammals. "A four- to five-day trip for an elephant that age is concerning," he said. When Maggie was brought to Alaska in 1983, she was the size of a small pony and weighed just a couple hundred pounds. She was trucked from a game farm in upstate New York to a New York City airport, where the Anchorage zoo's director accompanied her on a plane to Alaska, said Sammye Seawell, who founded the zoo and is a current board member. 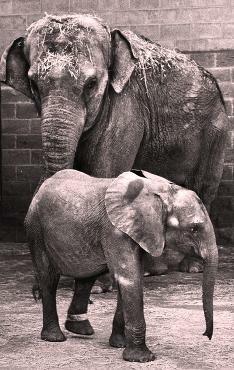 When the zoo's Asian elephant Annabelle arrived in 1966, she too was just a baby. Transporting such small animals was not the gargantuan task it is today with Maggie. Moving adult elephants is a logistics puzzle but not impossible, experts say. Circuses have done it for years, including international travel, said Jim Rogers, spokesman for the United States Department of Agriculture, which regulates the commercial transport of animals. Any company hired to transport Maggie will need to be registered with the USDA. Few airplanes can accommodate a crate tall enough to hold Maggie. A 747 jumbo jet is the most likely option, said Michael Foley, owner of California-based Global Animal Transport. The zoo may also consider the Russian-made Antonov An-225, another huge cargo plane. And if the zoo can't get Maggie on either of those, it may consider looking to the military, which has the Lockheed C-5 Galaxy, Foley said. The Air Force has helped before with large animals. When a killer whale named Keiko needed a ride from Oregon to Iceland in 1998, a C-17 Globemaster provided the lift. The most likely scenario is to fly Maggie out on a commercial 747 and truck her from the airport nearest her new home, Foley said. There's a lot to be done before that happens. First, she has to get an OK from vets who specialize in treating elephants. The Alaska Zoo will have to hire a couple and bring them up. Then Maggie will need to be crate-trained, which could take anywhere from a few days to several months, according to the national zoo association. Maggie's handlers likely will get her used to the crate by putting it in her enclosure, feeding her in it and letting her get comfortable. The crate, which Rieches says could weigh 4,000 pounds, may have to be custom built if the zoo can't get one from another zoo or transport company. "She could be moved to Florida as long as she's healthy and crate trained," he said. "It shouldn't be an issue." Airplane noise should be piped into Maggie's Alaska Zoo enclosure to allow her to adjust to the kinds of sounds she'll hear in the belly of a cargo plane, Foley said. All zoos that are near whatever transportation route she takes should be alerted in case something goes wrong and an emergency pit stop is necessary, Rieches said. Everything needs to be considered. When the San Diego Zoo transported 11 adult African elephants on a chartered jumbo jet from the Kingdom of Swaziland in 2003, absorbent diaper materials were layered in trays under the rubber floors of the elephant crates. "An elephant drinks quite a substantial amount of water, and we have to be able to catch everything," Rieches said. That 10,000-mile trip, made in segments, lasted 60 hours. The animals seemed to fare better than the human vets and handlers who accompanied them, Rieches said. The price tag for the whole trip: $1.5 million. It is unlikely that shipping Maggie will cost nearly that much, because she probably can be placed with other cargo on one of the many cargo planes that travel through Anchorage, Foley said. How much, though, is not clear. Foley guesses it could be hundreds of thousands of dollars. Seawell doubts it will top $100,000. Elephants usually travel well, according to the zoo association, but two have died in transit. In 1992, the Los Angeles Zoo's African elephant, Hannibal, died while sedated as he was being trucked to Mexico. In 2005, the Chicago Lincoln Park Zoo's elephant Wankie, traveling in a chilly trailer, was so sick on arrival at a zoo in Utah that she had to be euthanized. Sedating a traveling elephant is not recommended nowadays, although the animals may be given mild drugs to calm them down, experts say. Unconscious, elephants can go down and crush their lungs with their own weight. The public outcry surrounding Maggie surged when she lay down a month ago and could not hoist herself up. And an elephant needs to be able to keep its balance during takeoffs and landings. "You really don't want a narced-out elephant in a crate," said Mike Keele, deputy director of the Oregon Zoo and chair of the zoo association's elephant group. "What you want is a healthy, normal, alert elephant in the crate." The best-bet method, but expensive. Cost is $100,000-plus to fly an elephant out of Alaska, and some experts said it could be a lot more than that. It would be the fastest way to get Maggie to a new home. It's 2,400 miles just to get to Seattle. Maggie's no circus elephant; she's 8,000 pounds of attitude, and she hasn't been moved since she was a baby. The only truck Maggie is likely to see is the one that moves her from the airport to a sanctuary or zoo. Shippers say it's a 10-day voyage to Seattle, and they don't like to move live animals. A CHECKUP: Maggie needs to be examined and cleared for travel by veterinarians specially trained in treating elephants. The Alaska Zoo will have to hire a couple and fly them up here. A CRATE: She may need a specially built one and time to get comfortable being in it. That could be days, or months, experts say. NOISES: If Maggie goes by air, she first needs time to adjust to the sounds she'll hear in an airplane cargo hold. Pump some flight noise into her zoo enclosure.